REALITY TV shows have become popular in Nigeria in recent times. In fact, the successes recorded by some of them have sprung up more of these shows that one can hardly keep up with them. Sponsorships from reputable corporate organisations and the following noticed from viewers have also increased their credibility. Reality TV shows have become the preferred medium for multinational organisations to exhibit their corporate social responsibility which they owe their host communities. It is believed the youth, especially the unemployed, through participation in the shows have the opportunity to showcase and nurture their inherent talents for the benefit of the society. Some people also reason that the programmes would help vicious youths turn a new leaf since it is believed that an idle mind is the devil’s workshop. Every organisation wants to be involved as there are now different genres of reality TV shows, ranging from music, movies, sports etc. Prominent among them are: Gulder Ultimate Search, MTN Project Fame West Africa, The Next Movie Star, Star Quest, Nigerian Idol, Maltina Family Dance All, Nigeria’s Got Talent, Knorr Quest and recently, Destiny Child- a gospel talent hunt reality TV show. Presumably, the Destiny Child initiative would help fill the vacuum gospel music opened for the secular music to thrive. The reason for this assumption is because most winners of secular reality TV programmes come from church where they have been properly trained. They go secular after winning due to circumstances beyond their control. The record labels they are signed under do not support them to sing gospel music because it is generally believed that secular songs make more money and bring more fame than gospel. However, it is baffling to know that the church is churning out its members to the secular world; especially to the people it is obligated to save. Rousing emotions have been observed in those who get dropped during auditions and those evicted from the competitions, as they are not fortunate to compete for the grand prize. Some take their loss in good stride while others break down in tears. Contestants of these competitions get instant fame as they are watched by millions of viewers all over the world. The viewers are given the chance to vote for their favourite contestant(s) as the case may be. There is an ever-present live audience which the winners may not always get when they face the real world after the competitions. Asides these, they also get to meet important personalities from their various industries; people who become relevant to their career after the contest. 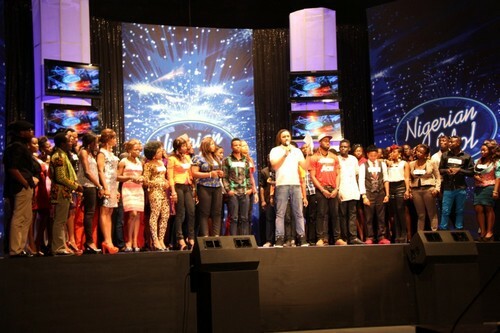 An example is the recently concluded MTN Project Fame West Africa, which was aired for 10 weeks on TV stations across the nation. Ayobami Ayoola won the grand prize, while Marvelous Odiete and Adetoun Adekoya were first and second runners-up respectively. They all had the privilege to meet On-Air-Personalities, international music producers, dancers and entrepreneurs who taught them how to invest their winnings. Winning a Reality TV competition does not guarantee sustainable success as some of the winners were last heard of during the contests. On the other hand, tremendous successes have been recorded by some of them. Popular products of reality TV shows making waves in Nigeria at present are: Timi Dakolo, Omawunmi, Inyanya, Praiz, Tonto Dike, Lydia Forson, Mike, Jodie, OC Ukeje, Chidinma, Yetunde, Tolu, Yeka Onka, Mercy, Monica Ogha and more. The aim of these reality TV programmes has been achieved in a way, due to the fact that it has prevented some of the contestants from going through the hassles of unemployment which some of their mates may still be grappling with. Their gifts have made a way for them just like the book of proverb says. More love should be shown to talented people especially the teeming unemployed youths by government and the private sector in any way they can in order to encourage youth development in the country. Music has been observed to be the most popular and successful of the different styles of reality TV shows in Nigeria today; and if music be the food of love, why not let it play on! So the unsung can be heard.